With the increasing sophistication of laser-guided munitions, an advanced and reliable test solution is now essential to successful operations. 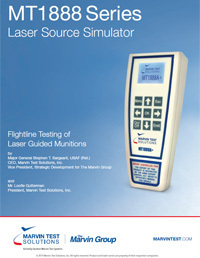 Offering hand-held, O-Level functionality, Marvin Test Solutions’ MT1888 laser source simulators deliver efficient functional test of munitions while loaded aboard aircraft. These state-of-the-art products feature compatibility with all NATO specification-based, laser-guided munitions in a portable, cost-effective unit. Please complete the form to the right to download the complete white paper. CEO, Marvin Test Solutions, Inc.
President, Marvin Test Solutions, Inc.